Standing on fractured sea ice near the front of Tunabreen glacier. In early February, I had the opportunity to gather with fellow scientists in Longyearbyen, the most northerly permanent village in the world. 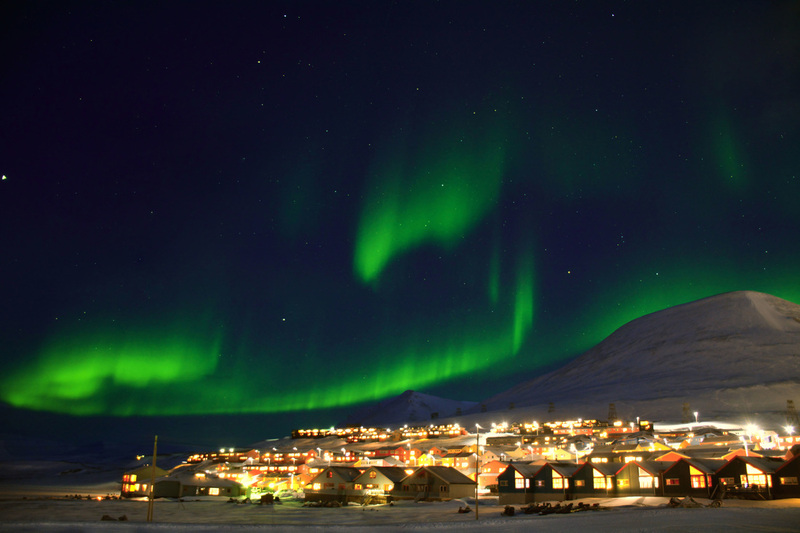 The town is in the Norwegian Archipelago of Svalbard at approximately 80°N latitude, slightly over a thousand kilometers from the North Pole. For that reason, it is the perfect place to explore the key issues currently facing the glaciological community. The most important: how do glaciers and large ice sheets respond to climate change, and affect global sea levels? While seemingly simple, this question can only be answered by unravelling complex relationships with potentially dire consequences for our civilization. Upon arriving in Longyearbyen, we had little time to acclimatize to the harsh conditions of the Arctic winter. During winter at this latitude, the High Arctic remains constantly in Earth’s shadow. In this polar night, the sun hides below the horizon for months on end. Darkness rests over valleys and peaks blanketed by snow. Temperatures fluctuate between -15° and -20°C. When the wind picks up, not only does visibility drop to zero as snow lifts into the air, but the wind chill factor drops temperatures down to nearly -40°C. In these conditions, the improperly dressed suffer from frostbite within a few minutes. Fortunately, we were equipped and trained to face the many challenges that accompany life in the High Arctic. In fact, we trained for a week before leaving town. Rifle training was mandatory, because Svalbard has the highest concentration of polar bears in the world. We always had to carry a gun into the field. We also received avalanche training to prepare for search and rescue. After all, snow lined the steep mountain slopes that surrounded every valley. Since the only efficient way of getting around was by snowmobile, we were taught how to operate and maintain these machines. 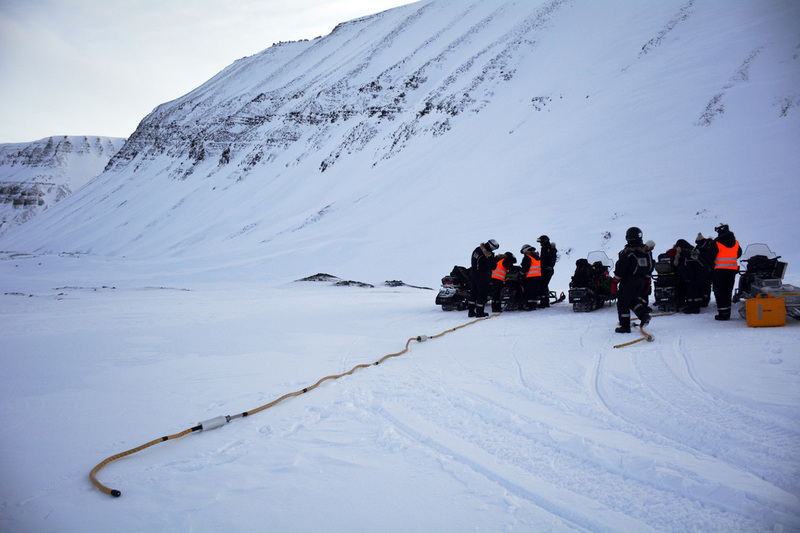 We were trained to manage emergency equipment and safely travel across Svalbard’s expansive valleys, sea ice, and glaciers. On the morning of our first excursion, we gathered at the logistics office of the University Centre in Svalbard. We equipped our heavy-duty snow mobile gear, and prepared to spend a full day out in the cold. With avalanche beacons activated and rifles in hand, we prepared the snowmobiles and headed out. As we left town the most pressing threat was frostbite, and so we carefully covered exposed skin. The onset of frostbite can be so rapid that it often goes unnoticed, as one's body numbs away the encroaching cold. Fresh polar bear tracks on the sea ice between seal-holes. As we trained for life in Svalbard's harsh environment, we also discussed glacier mass balance. You can find the mass balance of a glacier by taking the snow and ice it gains in the winter, and subtracting the ice that melts in the summer. Glacier ice has a tendency to form where winter snow survives consecutive summer melt season. For this reason, we travelled by snowmobile to the top of a glacier, where we dug a number of snow pits and measured temperature and density with respect to snow depth. This data allowed us to calculate the quantity of melted surface snow that could refreeze in the snow pack instead of draining off the glacier. Such field measurements are very valuable for assessing whether a glacier is likely experiencing negative mass balance, and therefore shrinking in size. Up on the glacier, preparing the ground-penetrating radar equipment. During the summer months, surface melt water flows down glaciers. This can lead to channels that melt their way into the ice, year after year. As these channels carve their way deeper, the slow yet persistent flow of the glacier can enclose the channels, forming ice caves. Some big questions remain about how water passes through a glacier and affects conditions at the base of a glacier, since this can drastically influence ice dynamics. Hence, we descended into an ice cave, to make observations on the state of the ice: from the sediments entrained in the ice, to the orientation of stress fractures. The annual melt water reforges the meandering drainage system, while the creeping ice continually attempts to close the ice caves. At present, the drainage system of glaciers remains a poorly represented component in simulations of glacier evolution, given that so few observations are available. These ice caves give us a firsthand look into how the plumbing of a glacier evolves over time. Venturing into an ice cave. Some of the most poorly understood parts of glaciers are under the ice. By understanding so-called “basal conditions” beneath individual glaciers, we can answer some very important questions. For example: how thick is the glacier? Is it resting atop bedrock or sediments? Is the basal ice close to melting, and are there channels which direct melt water at the base? For us to understand the dynamics of a glacier, we must answer these questions. To that end, we brought ground-penetrating radar equipment to a glacier. With the radar attached to our snowmobiles, we crisscrossed the surface of the glacier. Radar pulses have the ability to pass through ice and reflect off boulders, sediments, subglacial channels, and so on. The travel time of a radar pulse tells us the distance to a reflected signal. Our day out on the glacier yielded a plethora of crucial information. We discovered the thickness of the glacier, as well as the presence of subglacial meltwater channels and sediments beneath ice. These previously unknown properties of the glacier will help us better predict its behaviour to climate change. 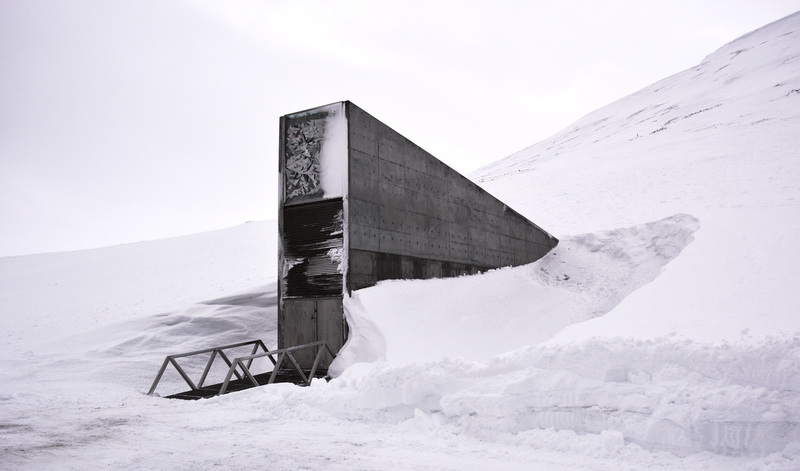 The entrance to the global seed vault. Researchers who study climate change are often motivated by a desire to help our civilization avoid, or at least adapt to, environmental catastrophe. Glaciers and ice sheets have the ability to change rapidly, and that can be very dangerous for humanity. 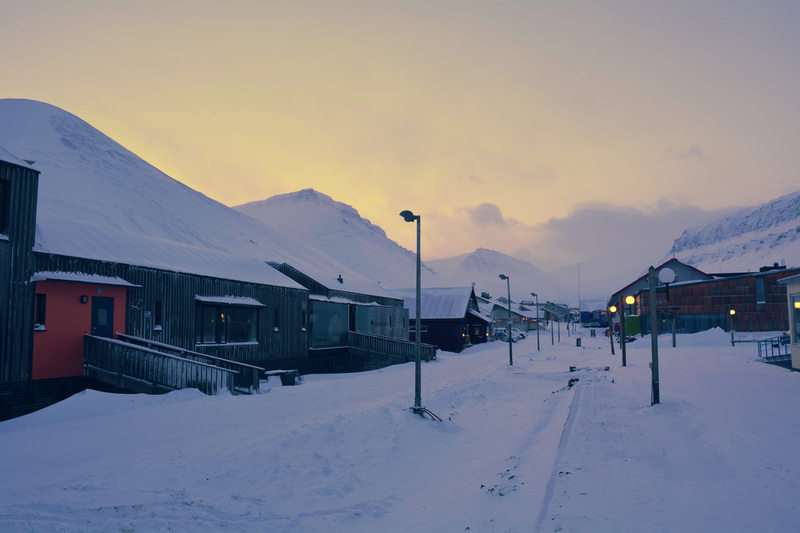 Little Longyearbyen is an especially good place for climate scientists to meet because it contains one of our ultimate safeguards against disaster. Up on the nearby slopes is the entrance to the so-called "Doomsday Vault," a structure that extends deep underground, into the permafrost. It is officially called the Global Seed Vault, and it is the ultimate insurance policy for the world’s food supply. It is a gene bank for plant seeds from around the world, and is intended to safeguard their diversity. Its seeds can repair devastation brought on by the connected hazards of war, natural disaster, population growth, and climate change. It is the ultimate back up for future generations. Fortunately for us, it is protected by its isolation in the High Arctic. 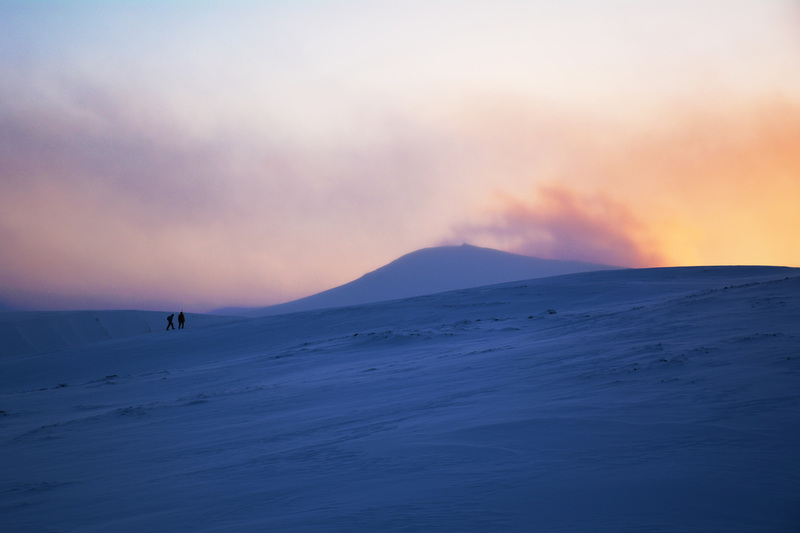 Hiking up the mountains surrounding Longyearbyen, at the first sunrise of the year. As the seminars and fieldwork concluded, the sun rose over the mountains for the first time since I arrived. 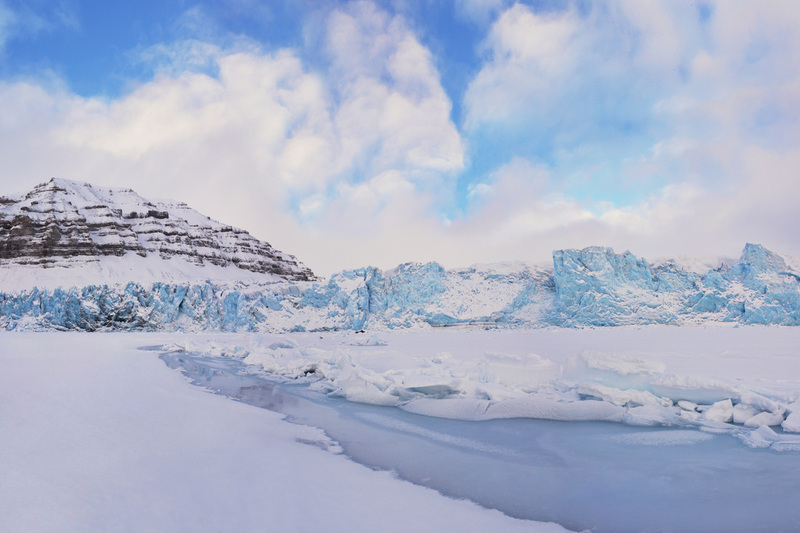 It was a wonderful chance to hike one last time across the suddenly illuminated, frozen landscape of Svalbard. We debated and learned a great deal in our month in Svalbard. One thing was clear: even though great progress is being made in our understanding of glaciers, in many ways they remain very mysterious.